A country that has had its confidence in nuclear energy shaken by the Fukushima crisis and a scandal involving counterfeit parts is moving ahead with four new nuclear reactors. 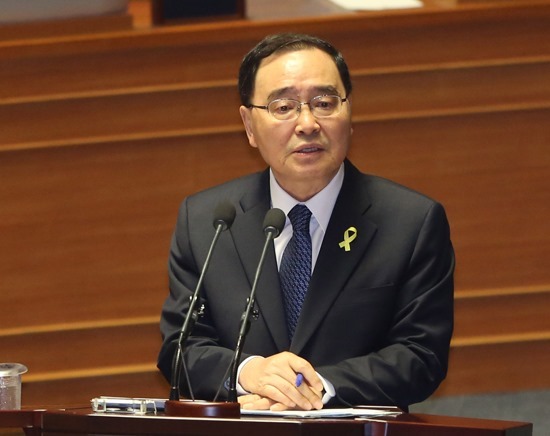 Prime Minister Chung Hong-won (right) told wire services a plan to build four new reactors is “an unavoidable choice” given the nation’s need for electricity to support its manufacturing base and to meet climate change goals. Construction will start for two new reactors in 2017 and another two in 2022. Taken together with previously announced projects, South Korea has work underway on 11 new nuclear reactors. There are 23 reactors already in operation in South Korea. The new reactors will likely be 1400 MW units similar to the technology the country is exporting to the United Arab Emirates where four of them are being built at a site on the Persian Gulf. New nuclear reactors are like money falling out of the sky for local communities in South Korea. The government says it will provide economic development support worth over $2 billion over a 60 year period to the areas where the new reactors will be built. Improvements include roads, schools, and medical facilities. The communities will also benefit from the payrolls of the construction work force and the permanent operations teams. World Nuclear News has a detailed description of the site selection process and how the South Korean nuclear industry gets local buy-in to the massive projects. Separately, South Korea and the U.S. reported progress in inking an update to a nuclear agreement that would permit reprocessing of spend nuclear fuel to manufacture MOX. Additionally, South Korea has announced plans to build a sodium cooled fast reactor with design roots in Argonne’s EBR-II. Despite postponing the start of construction for the first of eight reactors, Vietnam this week said it would commit to Russian supplied and built 1200 MW VVERs for the first four units. Previously, Vietnam was reported to have selected 1000 MW units. The change adds 800 MW to the power station. The reactors will be built at Ninh Thuan. The project will take advantage of port facilities at Cam Ranh Bay for delivery of reactor pressure vessels, steam generators, and turbines. Site work on the reactors will begin in 2017 and completion of the first unit is expected in 2023. Russia is reported to be financing 85% of the costs. Electricity of Vietname (EVN) to act as the investor of the Ninh Thuan 1 and Ninh Thuan 2 projects and will supply the remainder of the equity funding for the projects. Also, Rosatom will supply the nuclear fuel for all the reactors and take back the spent nuclear fuel from then for their entire expected 60 year operating lives. Domestically, construction firms in Vietnam are anxious to get moving as 40% of the work on the first four reactors will be assigned to local firms. The Russians are training hundreds of Vietnamese engineers to build and operate the reactors. Russia is also providing support to set up nuclear research centers at Vietnamese universities. One the reasons Vietnam pushed back the start date for construction of the first reactor is that it wants a credible workforce and a functioning nuclear safety agency. On this latter point, it is getting help from the IAEA. A second round of four nuclear reactors, NinhThuan 2, is expected to be built by Japan, and also will be located near Cam Ranh Bay near Phouc Dinh. A vendor for these units has not yet been named by the Japanese government. Like the Russians, Japan will finance 85% of the cost of the new reactors. Training of staff of about 1000 engineers is planned as part of the project. This entry was posted in Nuclear, South Korea, Vietnam. Bookmark the permalink.